HONOLULU – Hawaii Gov. Neil Abercrombie on May 8 commented on the results of a National Park Service draft study proposing that the Honouliuli Internment Camp be added to the National Park System as a National Historic Site or National Monument. Abercrombie stated: “The internment of Americans of Japanese ancestry was an example of race prejudice, war hysteria and a failure of political leadership. 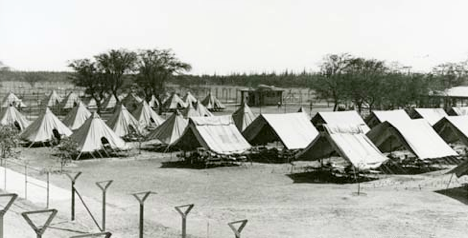 I applaud the National Park Service for recognizing the importance of preserving the Honouliuli Internment Camp to educate visitors about the internment history of Hawaii during World War II. “In 2009, while still in Congress, I joined other members of the Hawaii delegation to introduce bills to study the feasibility of Honouliuli and other Hawaii internment sites becoming a unit in the National Park Service. “As governor, I was pleased to sign Act 235 into law in 2012, requiring the state Department of Land and Natural Resources to establish a Honouliuli park site advisory group to develop recommendations to leverage county, state, federal and private funding of an educational resource center at the location. For more information on the Honouliuli Gulch and Associated Sites Draft Special Resource Study, visit www.nps.gov/pwro/honouliuli/. The NPS launched this study with an introductory newsletter and public meetings in February and March 2011. The alternatives presented and analyzed in this report were developed based on NPS special resource study criteria and the comments heard during public scoping. • Tuesday, June 17, virtual/online public meeting from 10 a.m. to 12 p.m. (Hawaii), 1 to 3 p.m. (Pacific), 4 to 6 p.m. (Eastern). The Department of the Interior, Environment, and Related Agencies Appropriations Act of 2010 (signed into law Oct. 30, 2009) authorized the NPS to conduct a special resource study of the national significance, suitability, and feasibility of including the Honouliuli Gulch and the associated sites within the State of Hawaii in the National Park System. The NPS is directed to consult with the State of Hawaii, appropriate federal agencies, Native Hawaiian and local government entities, private and nonprofit organizations, private landowners, and other interested parties. The study will evaluate Honouliuli Gulch and associated sites located on Oahu and other Hawaiian islands with respect to (1) the significance of the site as a component of World War II; (2) the significance of the site as the site related to the forcible internment of Japanese Americans, European Americans, and other individuals; and (3) historic resources at the site. At the conclusion of the study process, the National Park Service will submit a report to Congress that describes the findings, conclusions and recommendations of the study.